This is a step by step guide for different types of Spectrum models. You can read it through or you can go right to the description of the model you may be working with (in this case, follow the hyperlink above). In general, for any model, you need to reveal the cycles that have impact on your market and then create a projection line based on those cycles. Therefore, we provide very technical descriptions for any type of models, trying to cover all important issues regarding each model. If you have any questions, please contact us. Let us reveal the most influential cycles for some stock and then create the Neural Net projection line based on these cycles. You can change them and click button once again. Now we are ready to train Neural Network to obtain the projection line based on extracted fixed cycles. But before doing that, you should set up one very important parameter - the length of the training interval. You can take this parameter as the length of stock market memory regarding fixed cycles. Drag the mouse cursor to the maximum of the yellow diagram. In the left top corner, you will see the corresponding period of this "stochastic" cycle. Then click on "Training". The process of the Neural Net training starts, and soon you will get the projection line based on the revealed cycles. This is a very good tool to play with cycles trying to understand how they affect the stock market. Then you can use them in the Neural Net module as the inputs to get your projection line. Just repeat the steps you have done in the previous chapter. I would like to make some recommendations regarding how to choose the cycles. Recommendation A: The peak on the Spectrum diagram should be high and narrow. The narrower is the peak, the more certain you are that this cycle component is presented in the stock market data. In the example above, the red curve represents the Spectrum calculated on all available price bars (1988-2004). Blue represents the Spectrum calculated on the first interval (1988-1996 years), green - on the second interval (1996-2004). The most influential cycles are confirmed by all diagrams (like in this example). As an example, let us extract cycles and provide the wavelet analysis for these cycles. Run the Spectrum module and click on this button: . We'll get the list of the most powerful cycles for the market. Let analyze them one by one. This diagram represents the spectrum of cycle's activity for 58.1 days cycle. For example, one of the peaks is situated around 3 years (approximately). It means that our 58.1 days cycle mostly impacts the market with a 3-year periodicity. In other words, every 3 years there is a strong possibility that such a cycle (58.1 day) is playing an important role for the chosen market. We can find out any other important cycles of activity for this 58.1 days cycle. In other words, we can understand how 58.1 days cycle reveals itself in time. we do it through these wavelet cycles (we call them as w cycles). If we have enough information already, we can stop this process. Otherwise, we should continue and extract wavelet cycles for other longer cycles (141 days, 162 days, etc.). We recommend to provide this analysis for the first 2-3 fastest cycles (in our example, these are 58.1, 96.1 and may be 141.8 days cycles). The fastest cycles provide the most important information for the trader regarding short term price swings. This is why we recommend to provide more detailed analysis for the fastest cycles. The program automatically puts all these cycles into the clipboard, and we can create the Neural Net projection line following the same steps as in the previous example. A few words for advanced users regarding w cycles: To model these cycles, we use the special math approach. Modeling usual cycles, we used to apply sin and cosine waves; modeling w cycles, we use regular wavelets. This approach gives better results in revealing nonlinear effects caused by the interaction of different cycles. indicates how many overtones we use to model w cycles. The program automatically puts all these cycles into the clipboard, so we can create the Neural Net projection line following the steps as in the previous example. You can see that the detrended zigzag reflects the turning points better than the oscillator. The relative price oscillator is more oriented to reflecting the price movements, while the detrended zigzag "sees" the turning points only. Anything going between two subsequent turning points is not interesting for the detrended zigzag. If you decide to work with the detrended zigzag, use it as the target in the Spectrum module and the Neural Net module as well. After that the Spectrum will find the cycles for the detrended zigzag. 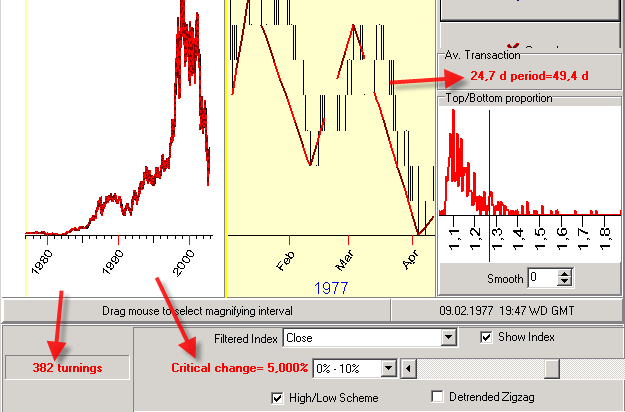 In this example, the setting of the critical change for the zigzag at 5% gives us 382 turning points; the average distance between two subsequent turning points is 24.7 days. It means that this zigzag generates an average 49.5 days wave. I have found that the Neural Net is very selectable to detrended zigzags - it likes some zigzags while there are some that it does not like. I tried to make Neural Net projection lines for 2%, 5% and 7% zigzags. It gives the best projection line for 5% zigzag. In any case, the zigzag used to calculate the Spectrum and the zigzag used for the Neural Net should be based on the same critical change. It makes sense to play with both possibilities. The short cycles area is very noisy, and this is unavoidable because the stock market is moved by too many different forces; in the long perspective, this mosaic looks chaotic. The irregular diagram in the short term cycles region simply reflects this fact. For example, if we consider 7 days cycle in the perspective of 7 years, this cycle will perform 365 revolves during this period. This cycle will be visible on a spectrum diagram only in one case - when it is able to keep its "nature" during all these 365 cycles. In other words, it should keep the phase (like its Monday price movements now should be similar to Monday price 7 years ago), it should keep its period of 7 days, not 8 days. In reality, the picture is much more complicated, especially regarding the cycles phase. I recommend to use the wavelet diagrams that make "cycles nature" visible. This spectrum looks a lot better. This model allows to catch non linear effects in models based on fixed cycles. If we assume that stock market is moved by some interacting cycles in some non-obvious/nonlinear manner, we should not expect getting a good spectrum diagram with high narrow peaks - because the spectrum diagram reveals only permanent cycles. The existence of nonlinear effect can make the peaks corresponding to any cycle wider, or "melted", or sometimes splitted (we have seen this while experimenting with different model examples). 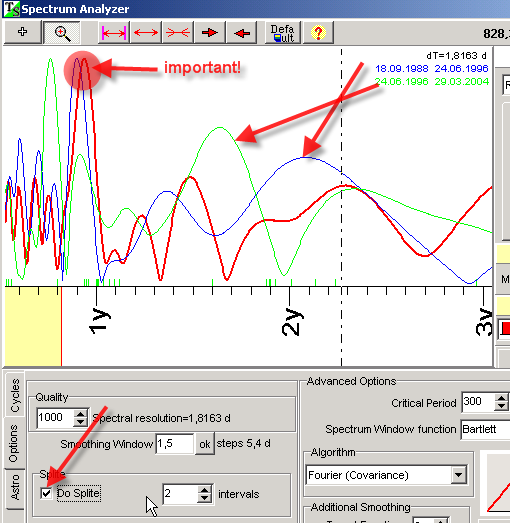 The best way to observe this effect is the usage of Spectrum Committee module in Timing Solution software. You see that all four spectrum diagrams show one of the peaks around 320-day cycle, it means that this cycle is strong enough. It presents in different time frames. We definitely should use it for the forecast. The most interesting feature of Spectrum Committee window is that we can select different active zones to create the Neural Net projection line. In other words, we create a bunch of fixed cycles with different periods. The Neural Network creates the model based on these cycles. Thus, we can catch nonlinear effects and changes in cycles periods. Actually, this is the first approach to one of our middle term projects, 6-12 months, to develop a special Nonlinear Spectrum that allows to reveal almost ALL possible cyclic processes in price data, linear and non linear as well. This is the most exciting feature of the Spectrum module. Instead of the standard Universal Time, we can use a new kind of time that is connected to planetary positions. We can consider this new time as a regular time, i.e. we can apply the typical math routines to reveal the cyclic processes in this time and make a forecast based on this time. The preliminary research definitely shows that this approach is worth to be used. The program will create the data base that is necessary for Planetary Time techniques. You need to do it just once. This is the planetary time defined by Mercury geocentric position. The experiment shows that the usage of the Sun Time only (that is close to Universal Time) provides the different Spectrum than for Universal Time. This affects the projection line based on such cycles drastically. Here we used the Sun Time. The period of strongest cycles is pointed in degrees, because the Planetary Time is measured in angles of appropriate planets. This diagram reveals the strongest cycle processes in Planetary Time flow. It looks like the "Algorithm B" provides the better results than "Algorithm A". We continue the research in this direction.